If you read our post last week, you’re all set with your San Juan Island with kids itinerary! Now, where to stay on San Juan Island with kids: while it’s true that the San Juan Islands are known as a destination for B&Bs, other options do exist. Read on for our top lodging experiences on San Juan Island, with a wide range of options for your family. If the kid-friendly factor is #1 in your book, but you don’t want to sacrifice quiet and tranquility while you enjoy island life, head to Lakedale. This island resort is located inland on a network of three small lakes, but is still only 4.5 miles from Friday Harbor. Entering Lakedale feels like entering summer camp: past the lodge and cabins is the general store, a crafts tent (usually with tie-dye t-shirts hanging to dry), and a swimming beach plus multiple docks with kayaks, canoes, paddle boats, and paddle-boards. Lodging includes log cabins, ‘glamping’ tent cabins, a retro Airstream, and a full campground. (There’s also a lodge with lodge rooms, but these are for guests 16 and up.) The Lakedale log cabins include kitchens and separate bedrooms, and their glamping tents include full beds, luxury linens, and even room for four (instead of the usual two per tent). We stayed in a cabin, and had plenty of room for our family of five. With the full kitchen, we were able to make meals in-house (though a grocery run pre-arrival is important…the general store is limited). We loved the back porch with lovely shaded views of the woods and lake, plus the space to start our own campfire in our fire ring. We also had a BBQ and lots of space for the kids the play. Listening to the bird song in the trees on the back porch in the evenings couldn’t be beat, even by ocean views. Kids have the run of the place at Lakedale; there’s a very comfortable, friendly atmosphere here. We rented paddle-boards for our kids, gave them ice cream money, and didn’t see them until dinner time. (Note: they were old enough to play unsupervised, but young kids do need an adult, of course.) The resort is located lakeside, but is also within easy drive of both Friday Harbor and Roche Harbor. Want to stay in the heart of it all instead? Located in Friday Harbor, right across the street from the pier, Island Inn is self-described as ‘off the coast of ordinary’. This boutique-style hotel has a forward-thinking approach to room rental: singles and couples can reserve small, view-less ‘euros‘ (private rooms), which include access to a ‘view share’: communal room with windows looking out over the harbor, kitchenettes, and living space. These rooms are available for families, too, but kids must be 16 and up. Families with younger kids can opt to reserve ‘sweets’ or ‘penthouses’, with up to nearly 1500 square feet. In all Island Inn lodging options, families can cook their own meals and relax in a home-like setting. Plus, those views? Are out of this world. Nightly rates range widely depending on season and room type, but in the off-season when we visited, they started under $200/night. Location: directly on Front Street! If you’re interested in all the amenities kids love, from an outdoor pool to lawn games and lots of space to play, but also want to be in the thick of things, you’ll want to head to Roche Harbor Resort. Many options exist for families here, ranging from a stay in the historic Hotel de Haro or historic cottages to village homes with 2-3 bedrooms. The lodging ranges drastically from new to old, but all are within easy walking distance (and view) of the harbor or bay. 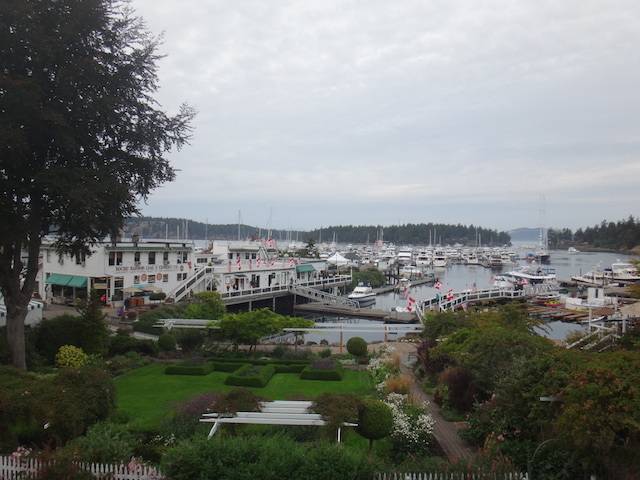 Roche Harbor is a busy marina, with lots of kids to see and do, and several dining options. Families will need to have a car, however, to explore Friday Harbor and the rest of the island. Snug Harbor Resort is one of those rare losing options that manage to be all things to all people. At first glance, it appears this sleek all-cabin and suite resort nestled on the tucked-away cove of Mitchell Bay would be suited only for yoga enthusiasts, cyclists, or couples seeking peace and quiet. This is perfectly true, but with its communal fire pits, complimentary kayak and paddle-board rentals, and green spaces, it’s also ideal for families with kids. 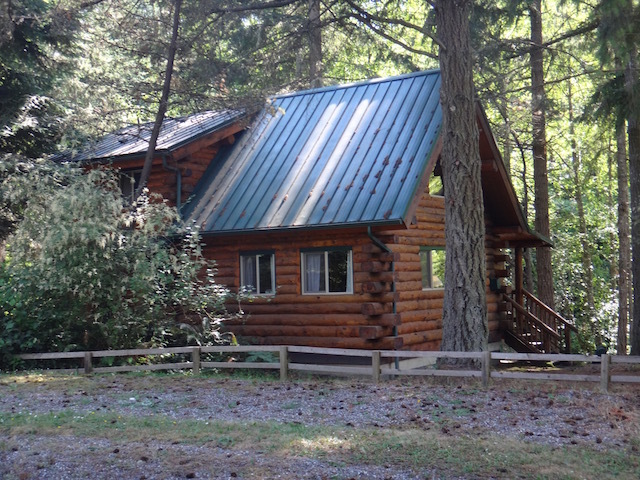 The cabins themselves have been newly remodeled and are absolutely beautiful. I stepped inside ours and sighed with utter contentment. Each has wood accents throughout, a gas-powered stove for heat, ample windows facing the bay, and a full kitchen. Ours had two bedrooms plus a pull-out couch, perfect for our family. We kayaked, paddled, ate s’mores, and yes, I practiced yoga on my porch overlooking the Salish Sea in the morning. There’s even a coffee shop on-site for your java-fix, and Roche Harbor is only about five minutes away by car, should you want an evening out. Snug Harbor Resort is located at 1997 Mitchell Bay Rd. Located just a few blocks from the heart of Friday Harbor, The Kirk House is owned by Doug and Roxy Kasman, who are warm, welcoming, and as far from the ‘fussy’ B&B type as you can get. Their property is a beautiful bungalow with a comfortable sitting room with four bedrooms leading off of it. Each has their own bathroom. While family groups can reserve the whole house (Doug and Roxy live off-site), this lodging experience is best without the kids. Each room at the Kirk House has its own character and own amenities. If booking just a few rooms (not the whole house) it’s recommended kids are 14 and up, as rooms are not baby-proofed, etc. Definitely call before booking to see which will be best for you. Some have tubs, others have large walk-in showers. All have wifi, and comfortable robes and heavenly beds. The neighborhood is quiet, even though the high school is across the street. The house features a lovely wraparound porch with rocking chairs, and some grass out front and gardens out back. Breakfast is included at the Kirk House, and it was fabulous. We started with yogurt and fruit parfaits with local berries and homemade granola, which would have been enough to fill me up! We were then served a delicious upside-down apple cake (again, locally sourced) and a honey-baked ham. Coffee, tea, and juice are available, and throughout the day, little snacks and goodies are set out. Call for room rates, and consider visiting in the off-season, when rates are lower and town is quieter! Where do you stay on San Juan Island? Check out our related post on nearby Orcas Island! I haven’t been to the San Juan Islands since a day trip in 2003 for a whale watching excursion. We absolutely loved the islands. We’re talking about visiting next summer, this time with our 8-year-old son. I’d like to overnight for at least one night. Staying in B&Bs with children can be tough, although we did find several throughout the U.K. on a visit there a couple of years ago. Good to know there are some options in San Juan Islands. We like to stay in local places as much as possible.